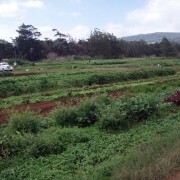 Ken and Roen Hufford have been tending their 10 acre farm in the Puukapu Farm Lots in Waimea for over 20 years. Originally started 30 years ago by Roen’s parents Marie and Bill McDonald, the farm grew mainly florals commercial sale. Marie is a re-known lei maker and is recognized as a living treasure by Smithsonian Institution. After Marie and Bill retired from full-time farming in mid-1990s, Roen and Ken continued operations and expanded to include organic vegetable crops – now the core of their business. Located at 2900 foot elevation the Huffords are able to grow a wide variety of produce regularly and many as well seasonally – Waimea lavender, kale, lettuces, carrots, beets, turnips and cabbage. They practice organic growing methods but are not certified organic. They supply retail, restaurants and sell directly at farmers markets. Farm tours and sometimes available by arrangment.